A fantastic visual aid for showing the steps required in balancing equations. Each slide begins as an unbalanced formula and particle equation. Particles of each reactant/product are added in a logical order until atoms of each element are balanced on each side of the arrow. 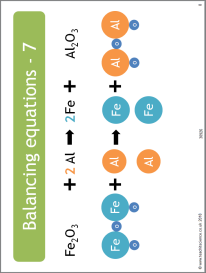 Talk through how the equations are balanced and the reasons behind each step or even better, get the students to do so.